Braintree Buddies beginnings is a true Archie’s story of family and service. Twenty years ago, Caitlin Loiter, a student in Braintree High School’s Project Prove Program for Special Needs Students had an idea. She may have been a Wamp but her heart was a Bishop’s heart. Her mother was on the AW faculty and her brother, Ryan, was a Class of 2004 Bishop. Most afternoons and evenings, Caitlin could be found cheering on her brother in basketball and soccer games and school plays. And Caitlin developed a real passion for Campus Ministry activities, as well. It did not matter that she was not a registered student; she was part of the AWHS community in a unique way. Caitlin was and is a “doer”. She often sees opportunities to make her fellow “special” friends recognized and accepted. She asked Campus Ministry Directors Judy Swett and Sr. Joanne Gallagher if she could bring her Project Prove classmates to Archie’s every month to make new friends with AW students. Now 20 years later the tradition continues. So, if you happen to pass by the CM room when Buddies are meeting, you would hear music; see crafts being made, dancing feet, snacks being eaten and lots of smiling faces. Another piece of Buddy history that is worth telling is that Braintree Buddies has enabled CM to thrive. In 2000, Braintree Buddies won a state wide contest that sought to recognize outstanding service initiatives. CM was awarded a $15,000 check with the monies to be used exclusively for future Campus Ministry activities. Buts that not all of the story. The checked was presented by Red Sox Star, Pedro Martinez who in the 2000 season was a Boston mega star. His appearance at Williams was kept a secret until the moment he appeared on stage in the auditorium. Pandemonium. No hyperbole in describing the moment, made even more special by Pedro being introduced, to the packed auditorium, in Spanish by Caitlin. Along with the introduction of Martinez, Caitlin explained to the assembly the importance of Special Needs students having friendships. 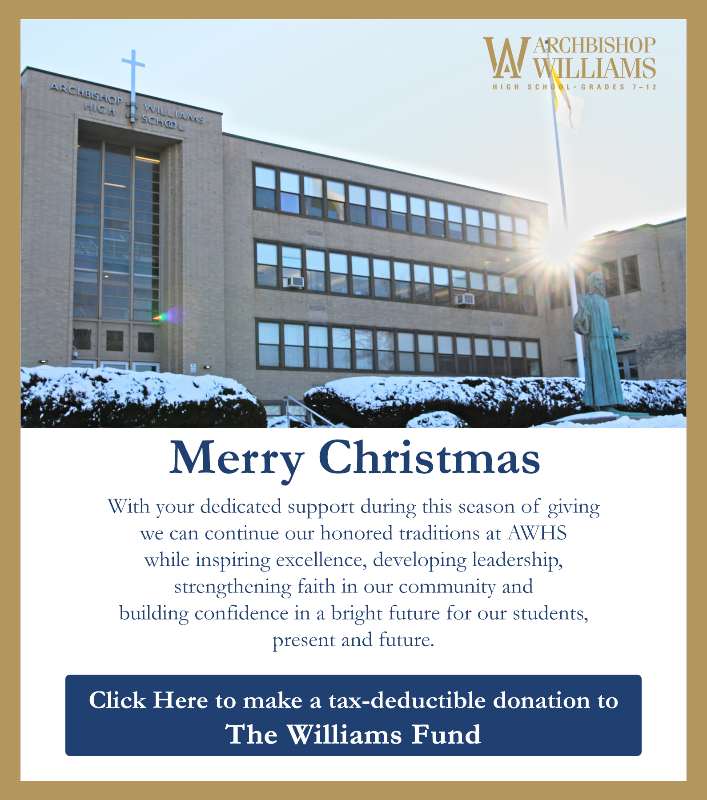 It is one of those moments, in the long history of our school that represents the very best of being an Archbishop Williams student, alumni or supporter. 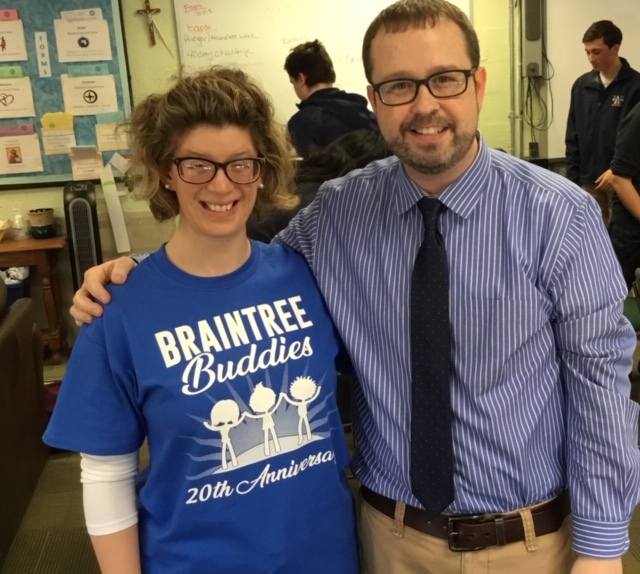 To celebrate the anniversary of Braintree Buddies, Buddies were given bright blue T-shirts that recognized the 20 year history. And Caitlin shared with all her special friends from Project Prove and Archie’s that she hopes the Buddies will be gathering for 20 more years!